NIFT Result 2019 | NIFT Situation Test Result 2019 | NIFT Entrance Result 2019 Date: The NIFT 2019 Result of Written Entrance Examination likely to be published in the month of February/March 2019. However, the Situation Test / Group Discussion / Interview will be held in April – May 2019. Finally, the Declaration of Final exam Result (Online) including NIFT Situation Test Result 2019 will be published on End of May/June, 2019. To get the admission into Bachelor of Design – B.Des. (Fashion Design / Leather Design / Accessory Design / Textile Design / Knitwear Design / Fashion Communication), B.FTech. Bachelor of Fashion Technology (Apparel Production), M.Des (Master of Design), Master of Fashion Management (M.F.M.) and M.F.Tech. (Master of Fashion Technology) candidates have to appear in NIFT Entrance Exam, the written test consist of GAT and CAT. However, NIFT publishes the entrance exam result for these written test exam in the month of February or March. On the basis of the result of written test GAT and CAT, shortlisted B.Des candidates will be called for the second test called Situation Test. For B.F.Tech. candidates, GAT will be the final test for selection. The candidates for M.Des will take GAT and CAT. On the basis of the result of GAT and CAT, in the case of M.Des. and GAT in the case of M.F.Tech and MFM, candidates will be called for Group Discussion/Personal Interview (GD/PI). Discussion and Interview (as the case may be) will be provisional, subject to their satisfying the prescribed eligibility criteria. During verification at any time before or after the Written Test, Situation Test, Group Discussion and Interview (as the case may be), if it is found that candidate does not fulfil the eligibility criteria, his/her candidature for the examination/admission shall stand cancelled without any notice or further reference. NIFT shall not be liable for any consequences on account of such cancellations. 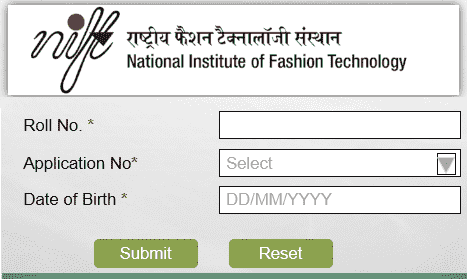 The result of the entrance examination will be displayed on the NIFT website. Written Entrance Examination for all UG & PG Programmes held on 21st January 2019. NIFT Result 2019 likely to be announced either last week of February or 1st week of March. On submitting the same, the NIFT results 2019 will be displayed on the screen. The candidates must take a print-out for future reference.